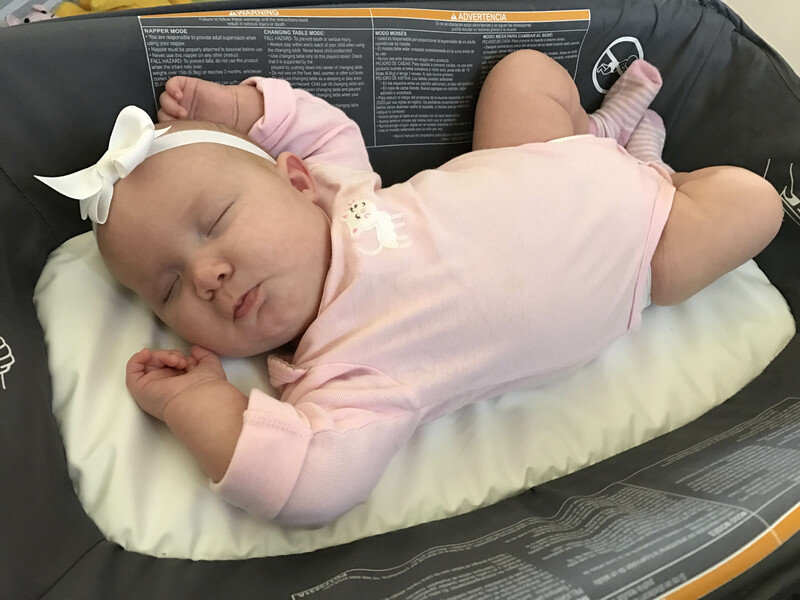 Right after her two-month mark, we put away the “3 Months” clothes and moved right up to “6 Months” because she was growing like a weed having more than doubled her birth weight! Violet really just loves passing out “milk-wasted” in my lap. She spent the first part of September still battling a double ear infection. We got a second round of antibiotics, and started having her adjusted at the chiropractor. Finally she got over it and was a sweet, happy girl again. 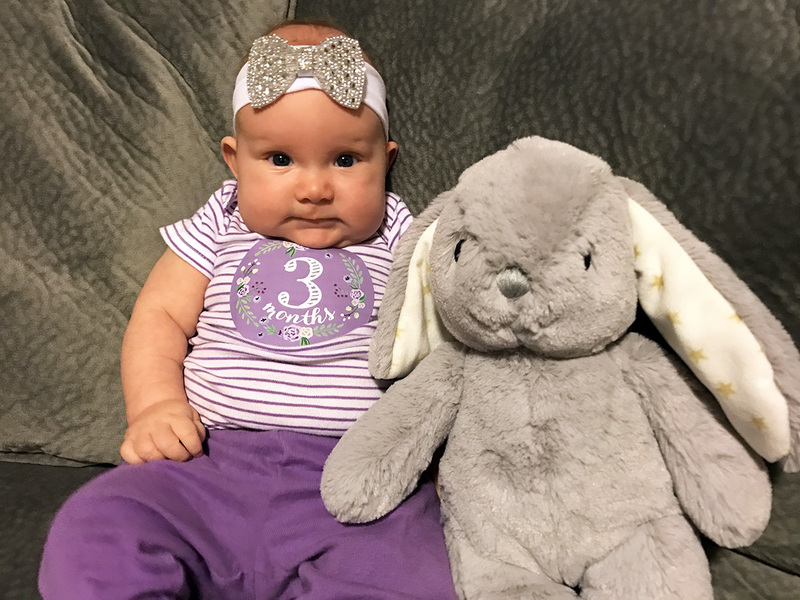 In month three, Violet was smiling and cooing more and more. She also started sleeping for six to seven hour stretches at night. Holla! She started to really love baths in month three. She also discovered her love of toys with faces in September; she stares at her “Snuggle Puppy” and will coo at him. Check out this video of it! Her cheeks are GIANT! That’s the first thing people comment on these days. I love those chubby cheeks, and I probably kiss them 50 times a day. I’ve taken to calling her “Chubby Bunny” which sometimes I shorten to just “Buns”. I know it’s weird, but it just comes out. Ha. Luke hates it. The day of the CyHawk game, she got to meet two of our favorite people – Rob and Nicole Lindquist! And, it was a great game, but the Cylones lost in overtime 44-41. On September 10, Violet was baptized. We had a lot of family in attendance. It was a very touching day for us. Godparents Aunt Rachel, and Uncle Chris and Aunt Joy were great picks for the job! Violet did great for most of the service, although she wasn’t a huge fan of the water. We had a lunch at our house afterward, and it was all-around a blessed occasion. Charlotte played the role of proud big sister all day. Also… there was Costco cake. 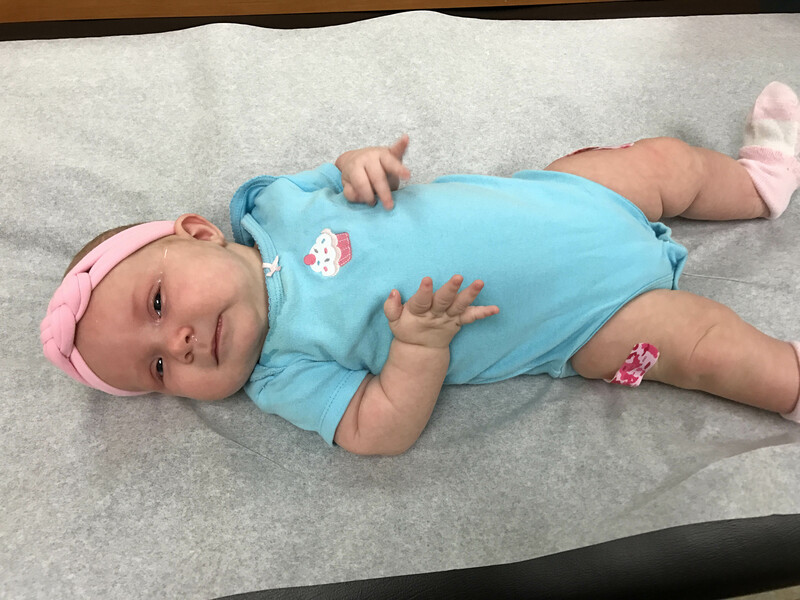 The next day, I had to take Violet back to the doctor to get her two-month shots since she ran a fever last time we were there. It was sad, and she slept most of the rest of the day. We were social butterflies that week. With maternity leave coming to end soon, we got out and lunched with friends Vicky (on my birthday) and Kristine. I also attempted my first mom’s night out with friends Traci and Mollie for my birthday, but it didn’t go too well. Most of our sushi dinner was spent responding to a frustrated Daddy because Violet wouldn’t take a bottle and was screaming the whole time. Needless to say, I headed home early. We had a similar experience a couple of days later. Luke and I went to Cosi Cucina for our first date since Violet was born, and our poor babysitter Jordyn got to deal with the screaming this time. We came home quickly again. So, after those two nights, we started to freak out that Violet wouldn’t take bottles although she had taken them before. With daycare looming, that made us nervous! More to come on that later. On September 23, Violet got to go to Boone to ride Thomas the Tank Engine with Charlotte and cousins. She did great the whole day – being strolled around the little mini carnival and even being nursed on the train ride (albeit a bumpy nursing session). It was a beautiful day to be out and about. So now comes the rough first week of daycare. We still hadn’t gotten Violet accustomed to bottles since her hiatus. We warned her daycare about it, and I was lucky enough to be able to work just half-days my first two days back. That first (half) day she only ate a half an ounce! The teachers were pretty concerned. The next (half) day she took 1.5 ounces. The third (full) day she ate 3 ounces. It was stressful for us and for her teachers, but they were great and stayed at it. They figured out she likes the milk really hot and to be wrapped in a blanket. And, we tried a few different types of bottles until she gave in. It was a week of two hours of straight nursing after work, but we made it! On September 29 she slept 10 hours through the night. It was amazing! All that fighting her bottles must have worn her out. She also made her first pilgrimage to the Dowtown Des Moines Farmers Market this month with Uncle Chris and Aunt Joy joining us. That was month three for our snuggly, chubby cheek monster!